It’s that time of the week again here at Statesman Ties. This week our featured country is Indonesia, the inspiration for our Indonesia tie. Let’s get started. 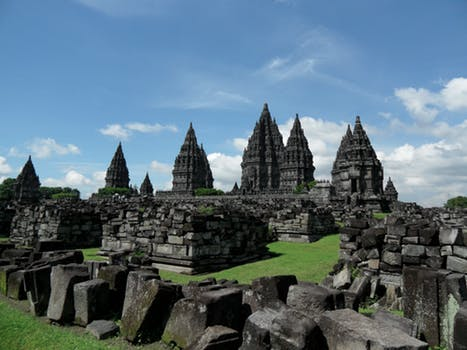 Fun Fact 1: Prambanan (pictured below) was built in 850 C.E. and is the largest Hindu complex in Indonesia. It was built and dedicated to the Trimurti (Trinity of the formless surpreme God), Brahma (expression of God as creator), Vishnu (the preserver), and Shiva (the destroyer), with the three main shrines dedicated to them. It was rediscovered in the early 19th century and restoration began in 1930. Fun Fact 2: Indonesia is huge – spanning 17,508 islands and three time zones. It is also the second most biodiverse country in the world (the first is Brazil). Indonesia is home to some truly amazing flora and fauna include the Sumatran tiger, the Javan rhinoceros, orangutans, the Komodo dragon, and the Rafflesia, the world’s biggest flower. My favorite fun fact: Indonesia is the exporter of kopi luwak. If you don’t know, kopi luwak is produced when coffee berries are fed to palm civets (small, cat-like animals). Their feces are collected, washed, and processed to create the most expensive coffee in the world – going for over $1,000 a pound. It’s prized because the digestion process of the civet removes all of the bitterness associated with coffee. What is your favorite fun fact is about Indonesia? Let us know in the comments. Swing by to check out our Indonesia tie. See you next week! Statesman Ties on Overstuffed – Unique Twists on Traditional Gifts for Dad!